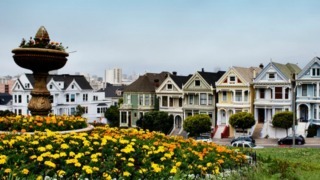 File image of homes in San Francisco. The Bay Area's three largest metropolitan areas are among the nation's highest when it comes to average rent prices for a one bedroom pad, according to recent report published by Abodo. San Francisco topped the charts with its average rent price of $3,526, far and above second-place finishing New York, which recorded an average rent price of $2,935. San Jose checked in with an average rent price of $2,508, good enough for the No. 3 spot on the list. Oakland settled in as the sixth-priciest city with an average price of $2,038. Despite being among the most expensive spots to live in the nation, Oakland actually experienced a roughly four percent drop in rent prices every month during 2016, according to the report. Average monthly changes in prices for San Francisco (-0.8 percent) and San Jose (-0.6 percent) also trended down this past year. If you're looking for a little rent relief, the average rent for a one bedroom apartment in South Dakota is an eye-popping — at least for Bay Area standards — $325, according to the report. If the Mount Rushmore State is a little too far away, Nevada's average rent cost for a one bedroom apartment is $783.